My awesome friend Liz Prince had a pretty big birthday last month and for the occasion I made her a stuffed and mounted frog head. 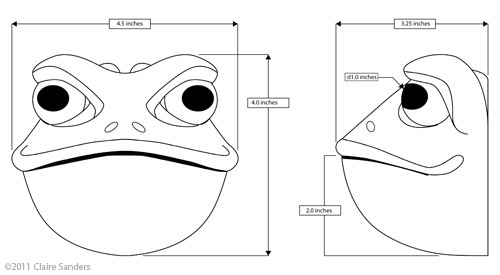 When I designing it, I had a toad in mind, but the since I ended up using a dark sage green fabric it ended up looking more like a frog. I approached making this the same way I make most plush things. I made couple sketches, then decided on a design and tightened it up to use as a guide as I made the fabric pattern. As you can tell, since fabric is such a flexible material, there are always changes from the tight drawing to the finished piece. It's not really necessary to make such a tight image for a plush concept, but it helps give me a very clear image to work from. 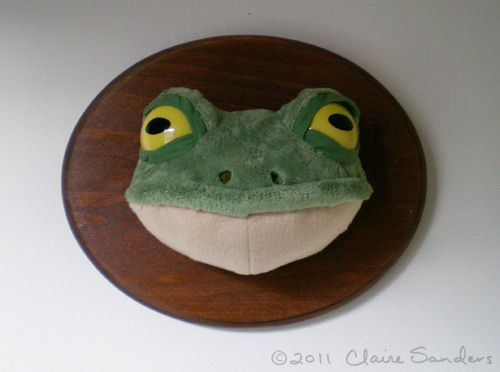 I found some plush that had little bumps already pressed into the fabric, which I thought would add some warty texture. Sadly because I stuffed the head so firmly, all the bumps were pushed out and lost. The eyes are clear plastic half domes painted from the inside with acrylic to maintain their shine. Here's something new that I learned as a shortcut when you're short on time. If you can't actually use wood stain because it takes a long time to fully dry, you can substitute thinned acrylic paint. It dries very quickly and it much less strong smelling. I'm not sure that acrylic would work on all woods, but the plaque I got was unfinished pine, so it soaked up the color. I covered the painted wood with a clear shiny shellac spray finish. 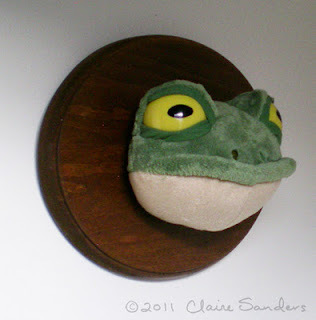 Liz already has quite a collection of mounted fake animal heads so this frog has found a nice place at her pad.